​The following is the text of the found in United States Code Title 4 Chapter 1. ​Any person who, within the District of Columbia, in any manner, for exhibition or display, shall place or cause to be placed any word, figure, mark, picture, design, drawing, or any advertisement of any nature upon any flag, standard, colors, or ensign of the United States of America; or shall expose or cause to be exposed to public view any such flag, standard, colors, or ensign upon which shall have been printed, painted, or otherwise placed, or to which shall be attached, appended, affixed, or annexed any word, figure, mark, picture, design, or drawing, or any advertisement of any nature; or who, within the District of Columbia, shall manufacture, sell, expose for sale, or to public view, or give away or have in possession for sale, or to be given away or for use for any purpose, any article or substance being an article of merchandise, or a receptacle for merchandise or article or thing for carrying or transporting merchandise, upon which shall have been printed, painted, attached, or otherwise placed a representation of any such flag, standard, colors, or ensign, to advertise, call attention to, decorate, mark, or distinguish the article or substance on which so placed shall be deemed guilty of a misdemeanor and shall be punished by a fine not exceeding $100 or by imprisonment for not more than thirty days, or both, in the discretion of the court. The words "flag, standard, colors, or ensign", as used herein, shall include any flag, standard, colors, ensign, or any picture or representation of either, or of any part or parts of either, made of any substance or represented on any substance, of any size evidently purporting to be either of said flag, standard, colors, or ensign of the United States of America or a picture or a representation of either, upon which shall be shown the colors, the stars and the stripes, in any number of either thereof, or of any part or parts of either, by which the average person seeing the same without deliberation may believe the same to represent the flag, colors, standard, or ensign of the United States of America. 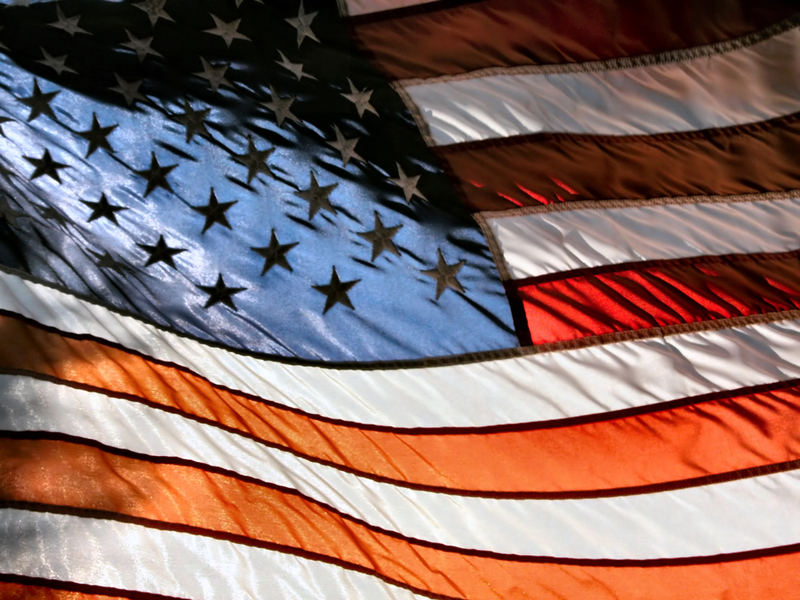 ​The Pledge of Allegiance to the Flag: "I pledge allegiance to the Flag of the United States of America, and to the Republic for which it stands, one Nation under God, indivisible, with liberty and justice for all. ", should be rendered by standing at attention facing the flag with the right hand over the heart. When not in uniform men should remove any non-religious headdress with their right hand and hold it at the left shoulder, the hand being over the heart. Persons in uniform should remain silent, face the flag, and render the military salute. ​The flag, when carried in a procession with another flag or flags, should be either on the marching right; that is, the flag's own right, or, if there is a line of other flags, in front of the center of that line. ​No disrespect should be shown to the flag of the United States of America; the flag should not be dipped to any person or thing. 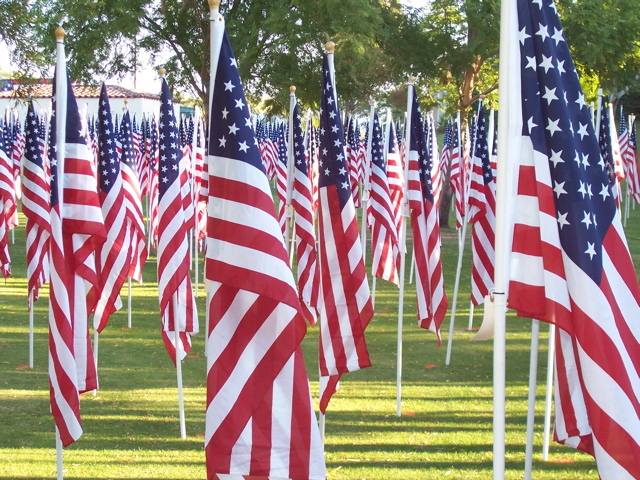 Regimental colors, State flags, and organization or institutional flags are to be dipped as a mark of honor. ​During the ceremony of hoisting or lowering the flag or when the flag is passing in a parade or in review, all persons present in uniform should render the military salute. Members of the Armed Forces and veterans who are present but not in uniform may render the military salute. All other persons present should face the flag and stand at attention with their right hand over the heart, or if applicable, remove their headdress with their right hand and hold it at the left shoulder, the hand being over the heart. Citizens of other countries present should stand at attention. All such conduct toward the flag in a moving column should be rendered at the moment the flag passes. §10. Modification of rules and customs by PresidentAny rule or custom pertaining to the display of the flag of the United States of America, set forth herein, may be altered, modified, or repealed, or additional rules with respect thereto may be prescribed, by the Commander in Chief of the Armed Forces of the United States, whenever he deems it to be appropriate or desirable; and any such alteration or additional rule shall be set forth in a proclamation.